The "Wealth Consciousness" Seminar is an approved ThetaHealing® Elective Seminar. This seminar was organized by Mark Anthony using the ThetaHealing Technique to help ThetaHealers adopt a "Wealth Conscious" mindset. A persons' mindset either draws or repels wealth towards them. For many, wealth seems to be outside of us but in actual fact wealth is a state of mind that you can consciously adopt whenever you want to. The purpose of this seminar is to raise our consciousness by using the Thetahealing tool so we can naturally align our vibration (sum of all our thoughts beliefs, attitude and feelings) with the universal laws that will create and sustain wealth in ways that will benefit all. 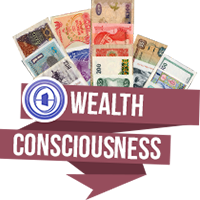 A Wealth Conscious mindset can be acquired by anyone and is not limited to only the few lucky ones or special and talented individuals in our Society. In the early part of the 1900's and throughout history it was noted that it took the most wealthy individuals almost an entire life time to acquire wealth but now with the shift in human consciousness people can tap into this mindset and acquire wealth in very little time. The overall objective and uniqueness of this seminar is to help shift our mindset from poverty consciousness to wealth consciousness where money flows into our lives more readily through doing the work that we love. To achieve wealth consciousness mindset 3 fundamental questions will be addressed throughout the seminar. What is the Highest truth about our Existence? This seminar was designed by Mark Anthony using the ThetaHealing Techniques and became an approved Elective in 2014.